The ample warnings about the potential consequences of SB 181 have done nothing to slow its push through the Colorado General Assembly. After passing through the House Appropriations Committee this morning, the bill is scheduled to be discussed on the floor this evening and a final vote is expected as soon as tomorrow. Ultimately, SB 181 could land on Governor Jared Polis’ desk a mere four weeks after it was first introduced. As SB 181 heads toward a final vote, here are five things you need to know. #1. This has been a rushed process. SB 181 was originally released at around 5 p.m. on a Friday evening, and just one business day later, the Colorado State Senate held its first committee hearing on the legislation. Undeterred, hundreds of oil and gas workers descended on the Capitol in opposition to the bill, causing the first Senate committee hearing to run until 2 a.m. Despite the numerous concerns being expressed by affected stakeholders, the bill flew through two more committees by that Friday. In just over a week of being introduced, the Senate passed SB 181 in the middle of an historic blizzard, which had paralyzed the Front Range and shut down the city of Denver and government operations (including the State House). The aggressive scheduling didn’t go unnoticed. Denver-based 9 News journalist Marshall Zelinger pointed out how unusual that timeline is from a legislative standpoint. “Democrats hold all the power in the General Assembly and cannot be stopped by anyone but themselves. We urge them to pump the brakes on this particular piece of very complex legislation that has implications for the health of our public and our economy,” the Post wrote. #2. Diverse voices have spoken out against SB 181. #3. The financial costs of SB 181 have not been fully evaluated. The rushed nature of SB 181’s legislative process have created more questions than answers over its potential financial consequences. The bill’s fiscal note identifies minimal costs, most of which are associated with hiring new government staff personnel, but never addresses the economic costs of increased regulation or potential decreases in oil and gas production. This is especially concerning in light of the expected slowdown in permitting approvals that will accompany the passage of the bill. In the weeks since the bill has been unveiled, numerous reports and testimonies have emerged to attempt to fill in those knowledge gaps. For instance, a vice president at Great Western, a privately owned Colorado-based oil and gas company, testified that the bill would force his company to cut its capital expenditure plans by more than 50 percent. And a report completed by the REMI Partnership found that if new oil and gas development is reduced by 50 percent due to COGCC’s added discretion to hold up new permitting, many jobs and billions in GDP could be at risk. A recent report commissioned by the Colorado Oil and Gas Association and compiled by the University of Colorado Denver’s Global Energy Management Program calculated that in 2017 the oil and gas sector accounted for 89,000 jobs and $13.5 billion to Colorado’s economy. Long story short, there’s a lot at stake depending on how SB 181 is implemented. #4. SB 181 is being paraded as “health and safety” legislation, but is being rushed through the legislature ahead of the Colorado Department of Health and Environment’s expected oil and gas report. 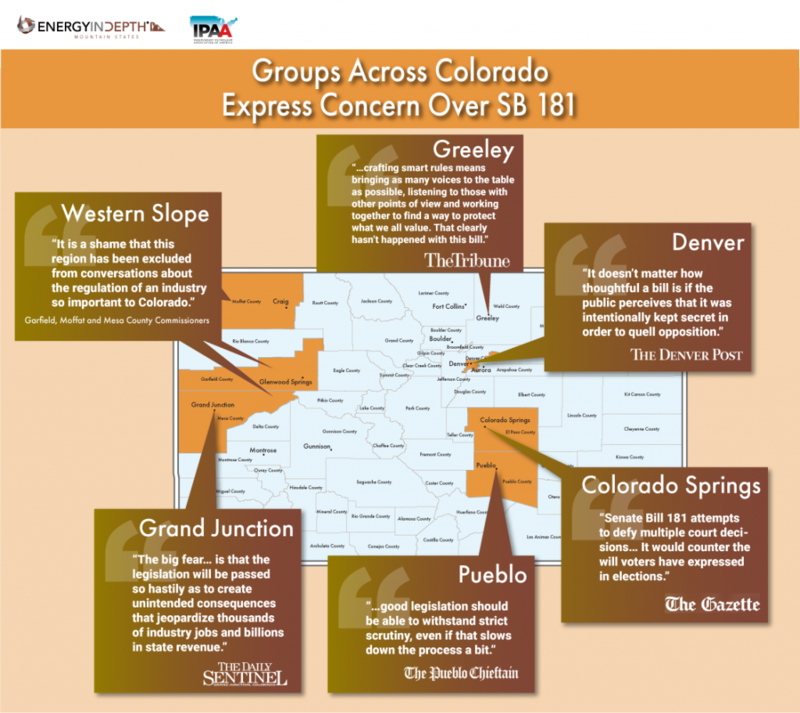 The sponsors of SB 181 and its proponents have consistently said that the bill is needed due to health and safety concerns surrounding oil and gas operations. So then why not wait to pass legislation until after the release of the CDPHE’s health assessment that is due by the end of the first quarter? The assessment was initially projected to be released in 2018, but two delays pushed its release into the new year. If the concerns expressed are realistic, the health assessment would show that – and yet Democrats have pushed SB 181 to be signed prior to CDPHE’s publication. The end of March is quickly approaching, and the long-awaited assessment is nowhere to be seen. #5 The economic hit from SB 181 will come during a push for more public programs. This push for increased rules and regulations that could stifle development comes at a time when revenues for the oil and gas industry are needed more than ever. One of Gov. Polis’ top campaign pledges during the 2018 election was to institute statewide full day kindergarten. His recent budget put that price tag at $227 million per year. Under Colorado’s system, schools are funded via local property taxes, and if there is a shortfall, the state makes up the difference. Oil and gas happens to pay hundreds of millions of dollars in property and other taxes per year. The state of Colorado can afford Polis’ $227 million program this year, but beyond the year 2020 there remains doubt due to external factors in the housing market. If the amount of property taxes paid by the oil and gas sector decreases as a result of SB 181, the state will be placed under increased financial pressure to backfill. Many questions remain unanswered about SB 181’s rush to passage; the impact of bipartisan and diverse voices rising in opposition; the true cost of the bill due to the many uncertainties that legislators and legislative staff themselves acknowledge; the lack of apparent whereabouts for a state health assessment that has been repeatedly delayed; and how the state will pay for new educational programs if it guts a primary source of revenue. SB 181 could upset not only the regulatory certainty necessary for a thriving oil and gas sector, but significantly disrupt government revenue stability, and risk being passed without input from the state’s top medical and health officials. Follow @EIDMtnStates on Twitter throughout the evening for more updates on SB 181.